European mine waste management is governed by the Extractive Waste Directive (2006/21/EC) but hazardous assessments are conducted according to a broader hazardous classification legislation encompassing all waste types. Consequently, there is a risk of misinterpretation when using one system for all wastes. This article assesses potential issues with the current approach. Literal interpretation of the legislation could over-emphasise or under-estimate risks and hazardous classification focuses on solid phase compositions, with minimal consideration to leachate formation over time. Correct designation of waste is essential; it influences waste management plans and has implications for categorisation of mining waste facilities. Tailoring each site-specific assessment is crucial and a variety of information sources and legislative documents should be consulted to provide the most relevant classification. This article considers the current European legislation governing the classification of hazardous waste in the context of mining waste, highlighting the possible issues that may be faced and how this has the potential to affect environmental sustainability. Within Europe, assessment of mine waste is governed by the Extractive Waste Directive (EWD) (2006/21/EC). The EWD enables the characterisation of waste as inert or non-inert depending upon sulphide content and metal concentrations; however, the classification of hazardous waste is governed by a broader legislative scope which encompasses all waste types including domestic and industrial sources. Classification of mine waste should involve a holistic approach that considers all aspects of legislation collectively, together with a thorough geochemical assessment and predictive modelling; applying the hazardous classification alone could potentially result in risks being under-estimated or issues over-emphasised. A number of waste legislation documents exist, including key documents summarised in Figure 1. Documentation can be frequently amended or updated, so experience in applying the most relevant is essential. In the mining industry, the classification impacts the mine waste management plan and has implications for the categorisation of waste facilities. Where waste is classified as hazardous it must be stored in a ‘Category A’ facility, which has administrative, economic and social implications on the mine in terms of monitoring, construction, regulatory scrutiny, financial security and public perception. Figure 1: Summary of the current key legislation pertaining to hazardous waste assessments. A report assessing the performance of Member States regarding the implementation of the EWD (EC, 2017) concluded that there were inconsistencies regarding the application of the criteria for classification of waste facilities as Category A, suggesting that the legislation is subjective and open to interpretation. A recent technical guidance has been published (EC, 2018) to assist with waste classifications and although this provides a useful tool, it is not tailored specifically towards the mining industry, so experience in interpreting and applying all of the legislation together is essential. Waste assessments should be tailored to each site from an early stage in order to establish an adequate sampling program. A variety of information sources should be consulted as part of the assessment in order to provide the most appropriate categorisation; these include current legislation, chemical databases and site-specific data. To maintain environmental sustainability the EWD encourages recycling, reclaiming and reusing of waste rock and tailings materials. A separate geochemical and geophysical assessment is required to assess rock suitability for uses such as construction materials for waste facilities or roads. The hazardous waste classification is not sufficient to assess environmental impacts and a more thorough risk assessment approach should be used. Ideally, the assessment of the suitability of waste rock for reuse should be made before the materials are officially classified as “waste” and enter the waste stream. Mirror hazardous or mirror non-hazardous (potentially hazardous or not depending upon the classification outcome). Both of these European waste codes are “absolute non-hazardous” entries which, in theory, require no further hazardous assessment. In the case of mining waste, allocation of one of these codes has the potential to have significant negative impacts on the environment, since waste rock can have acid generating and metal leaching potential. Whilst the Waste Framework Directive (WFD) specifies that waste can be considered hazardous if it displays hazardous properties, even if it does not appear as such on the LoW, officially extractive waste is excluded from the WFD scope. The requirements of the EWD are to ensure that waste is managed to prevent harm to the environment (including water, air, soil, flora and fauna) and prevent any negative impact to human health. In which case, relying solely on an absolute non-hazardous code is inappropriate and a more in-depth geochemical and geophysical assessment is necessary. For the majority of industries, the waste classification process is carried out on an actual waste product generated. However, in the case of the mining industry, the hazardous assessment often needs to take place at the planning stage before any waste is produced. Guidance on material sampling and testwork is given in Council Regulation 440/2008 and European and British Standard (BS EN 14899:2005) plus supporting Technical Reports. Since all mine sites are different, it is important to develop a site-specific sampling program which is tailored to include an appropriate suite of analytes, number of representative samples and suitable limits of detection, low enough to assess any potential environmental impacts and compare to natural baseline levels. An unsuitable sampling plan can lead to potentially significant environmental impacts if, for example, key parameters are not included in the hazardous assessment or if the selected samples are not entirely representative of the likely future waste. Care should also be taken to address material heterogeneity. Hazardous assessments often focus solely on multi-element assay data but consideration must also be given to leachate generation under the broader extractive waste legislative scope. Mineralogy data should be considered, but can raise issues through potential false flags, discussed further below. It may be necessary to consider particle size distribution (PSD) to determine grain sizes and whether substances are present in respirable form, or more specialist testwork such as flammability or slake durability testing. Processing chemicals must also be considered in tailings waste. The hazardous assessment process can be undertaken on any number of parameters and there are no specifications for minimal detection limits, therefore a high level of technical knowledge is crucial to ensure that the assessment is robust enough to meet regulator/stakeholder requirements. Hazardous waste assessment legislation typically focuses on solid phase composition, with minimal attention to leachate formation. Generally, solid waste is assessed according to hazard properties HP1 to HP15 and any leachates are assessed as separate waste streams. The hazardous assessment informs the classification of mine waste facilities (MWF) and, according to the EWD, a MWF must be designed to prevent pollution to surface and groundwater. Therefore, a more environmentally sustainable approach would be to consider leachate generation in conjunction with the hazardous waste assessment on solids. Whilst risks to water bodies are considered under separate legislation including the Water Framework Directive (2000/60/EC), there does not appear to be a clear overlap with the hazardous assessment process. This could lead to a non-hazardous classification for wastes capable of leaching metals to the environment. Commission Decision 2009/337/EC also states that facilities containing reactive waste must be assessed to evaluate the release of contaminants which may result from incorrect operation of the facility during operations and post-closure regardless of whether materials are hazardous or non-hazardous. This supports the hypothesis that a full geochemical and geophysical assessment is necessary for any material stored in a waste facility; a hazardous assessment alone is not sufficient and an integrated approach is required. Table 1 gives an example of geochemical testwork results for a greywacke sample taken from a potential mine site in Europe. The sulfide concentration is 4.09% and antimony, arsenic, cadmium, lead, tin and zinc are elevated by more than three times the average crustal abundance. Short-term leach test results showed that cadmium and nickel were leached at concentrations exceeding the European Environmental Quality Standards (2013/39/EU). However, Figure 2 illustrates that the solid sample is classified as non-hazardous according to hazardous waste legislation, which includes an assessment of ecotoxicity (HP14). 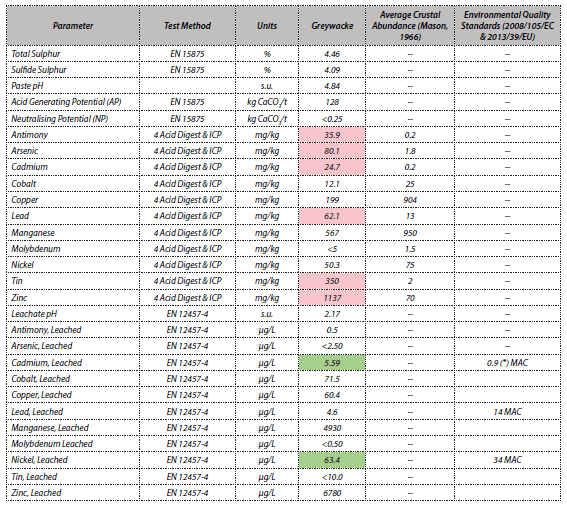 Table 1: Example of key assay data for greywacke sample. Figure 2: Example of non-hazardous classification. Chapter 19 of the LoW refers to: wastes from waste management facilities, off-site waste water treatment plants and the preparation of water intended for human consumption and water for industrial use. In theory, leachates could be given a European Waste Code from this chapter and assessed using the same methodology as is applied to solids. In this instance, the leachates are considered as a separate waste stream so this does not address the issue of whether solid waste should be classified as hazardous in the first instance based on its potential to generate a harmful leachate. The hazardous waste legislation does not specify separate threshold values for leachates, and employing a simple conversion to the solid thresholds is inappropriate for assessing environmental impacts. For example, the lowest ecotoxic threshold for mercury which will trigger a hazardous classification by HP14 is currently 0.25% (equivalent to 2500 mg/kg or 2500 mg/L, with minor adjustments due to density effects). This is significantly higher than the MAC of 0.07 µg/L (2013/39/EU) (Table 2). New legislation governing the classification of HP14 Ecotoxic comes into force in July 2018 but this will generally result in identical or more lenient thresholds. 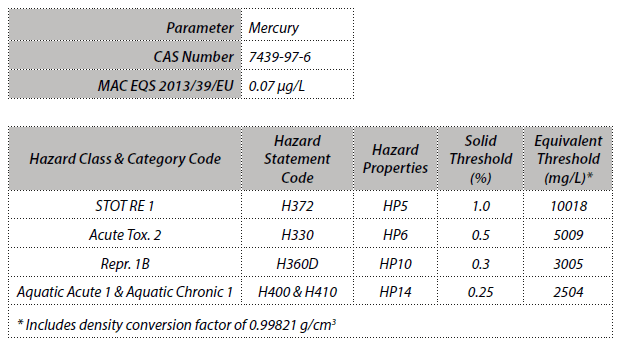 Table 2: Example of hazardous assessment thresholds for mercury. Over-estimating hazardous properties could initially be viewed as the most conservative approach, with more waste facilities being classified as Category A. However, considering the triple bottom line (social, environmental and financial), it is not necessarily the best approach. For example, the emplacement of Category A facilities can have huge social implications such as the NIMBY (“Not In My Back Yard”) concept. There are obvious additional financial and administrative commitments for any mine constructing a Category A facility. There is also a potential for environmental regulatory focus to be diluted if everything is classified as Category A rather than the cases where it really is necessary for hazardous waste. Inexperience in applying the hazardous waste legislation to mine waste can lead to over-estimation of hazards. In many industries waste chemical compounds may be well known; however, in the case of mine waste it may not be possible to analyse for all specific substances likely to exist, particularly if the mine is still in the planning stage. 2018/C 124/01 guidance advises on a ‘reasonable worst case’ approach to selected substances. Simply opting for an absolute worst-case every time can result in a potential over-estimation of hazardous properties and inappropriate waste classification. A multi-element assay provides concentrations of individual elements so it is necessary to apply a good level of understanding of the chemical and physical properties of various compounds likely to be present under the conditions anticipated within the waste, considering factors such as solubility or reactivity plus site-specific geology. Mineralogical data can be included in the hazardous waste assessment process. However, a strong understanding is essential to ensure that results are applied correctly, as it is possible to misinterpret the legislation or guidance, which can lead to an unnecessary hazardous classification. 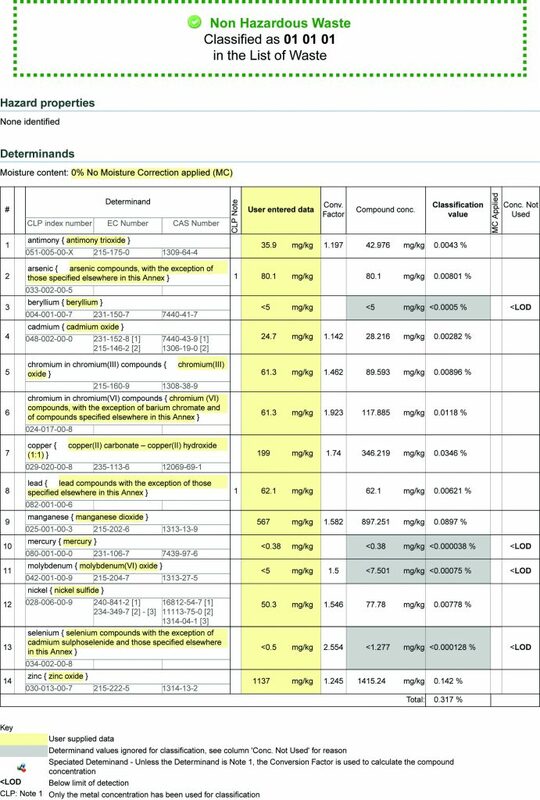 Some of the most abundant minerals within Earth’s crust are listed in the C&L Inventory (ECHA) with numerous hazardous properties associated with them. Table 3 provides some examples for quartz, feldspars and muscovite, including threshold values at which they would be classified as hazardous. These minerals may be present in large quantities within mine waste, regularly exceeding the maximum 25% threshold. The average crustal abundance of silica is 27.7% (Mason, 1966), and a literal interpretation of the guidance could therefore result in a hazardous classification for what may otherwise be inert waste rock. In this instance, it is important to consider the physical form of substances. All of the hazard statement codes listed in Table 3 relate to ingestion, eye irritation or respiratory inhalation and are therefore related to the substances in a dust form rather than at the coarser grain sizes likely to occur in nature; the hazards for quartz for example, would relate to silica dust. Therefore, it would be inappropriate to classify all waste rock as hazardous based upon a high quartz content. There is an opportunity to support this with particle size distribution data for the waste in question, if necessary. It is also important to note that these mineralogical entries in the CLP are non-harmonised; they have not been formally classified at EU level. To fully assess the risks, a variety of peer reviewed scientific data sources should be considered including, but not limited to, the Registered Substances Database, IARC Monographs and peer reviewed scientific papers, to present a comprehensive case for any hazardous/non-hazardous classification. European legislation relating to the classification of hazardous waste is generic to a variety of industries and not tailored specifically to mining. To ensure the protection of the environment and appropriate classifications, assessments conducted on mining waste need to use a more holistic approach encompassing several pieces of key legislation relating to hazardous waste classification, the EWD and Water Framework Directive. Experience in understanding and applying the various legislative sources is necessary for environmental protection. It can also affect the financial and administrative commitments of the mine and have significant social implications. The initial aim should be to reuse, reclaim or recycle waste even before it enters the waste stream. In the case of mining, this could include using waste rock in construction. A thorough geochemical and geophysical assessment is required in this instance to ensure suitability for use; it is not appropriate to rely solely on a hazardous assessment. 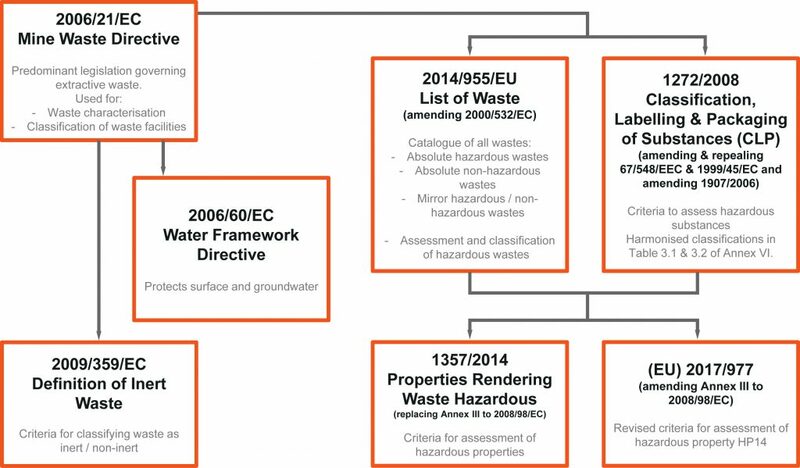 A number of challenges may be faced when applying the European hazardous waste classification to mining waste if other legislation is not taken into consideration as part of the process. According to the List of Waste (2014/955/EU) there is an opportunity to automatically categorise waste rock as an absolute non-hazard but it is essential that the materials are assessed for their potential to generate acid or leach metals that could have a detrimental effect on the environment. The assessment should be in accordance with the EWD and other industry-recognised guidance such as the Global Acid Rock Drainage (GARD) Guide (INAP, 2017). Without relevant experience, it is possible to conduct an inadequate testing program, potentially missing key parameters or using unsuitably high detection limits. Minimum requirements are not flagged as part of the waste assessment and therefore a high level of technical knowledge is essential. The hazardous assessment process places a great deal of emphasis on concentrations of hazardous properties within solid waste and there is minimal focus on the potential for that waste to generate leachates that may have a negative impact on surface or groundwaters. Solely following a hazardous classification approach, it is possible to categorise potentially acid generating waste with elevated metals content, as a non-hazardous waste. It is therefore essential to adhere to other legislation such as the EWD alongside any hazardous classification. If leachates are assessed according to the same thresholds as solid waste, the limits offer no protection to the environment. There are several ways in which hazardous risks may be over-emphasised if the waste classification is not appropriately applied. For example, not selecting an appropriate species within the waste can result in an over-estimation if a worst-case scenario approach is adopted. Common minerals within rock (for example quartz) can trigger an unnecessary hazardous classification if a literal approach is applied. In summary, the EU hazardous waste assessment process should not be applied to mining waste in isolation. Whilst it can help inform decisions regarding the categorisation of waste storage facilities, the hazardous assessment legislation alone may not provide complete environmental protection. Mine waste classification requires an integrated approach where all aspects of the legislation are addressed in unison. Commission Decision of 18 December 2014 amending Decision 2000/532/EC on the list of waste pursuant to Directive 2008/98/EC of the European Parliament and of the Council (2014/955/EU). Commission Regulation (EU) No. 1357/2014 of 18 December 2014 replacing Annex III to Directive 2008/98/EC of the European Parliament and of the Council on waste and repealing certain Directives. Council Regulation (EU) 2017/997 of 8 June 2017 amending Annex III to Directive 2008/98/EC of the European Parliament and of the Council as regards the hazardous property HP 14 ‘Ecotoxic’. Directive 2000/60/EC of the European Parliament and of the Council of 23 October 2000 establishing a framework for the Community action in the field of water policy, commonly referred to as the Water Framework Directive. Directive 2013/39/EU of the European Parliament and of the Council of 12 August 2013 amending Directives 2000/60/EC and 2008/105/EC as regards priority substances in the field of water policy. European Commission (2017), Assessment of Member States’ performance regarding the implementation of the Extractive Waste Directive; appraisal of implementation gaps and their root causes; identification of proposals to improve the implementation of the Directive, Final Report. European Commission (2018), Notices from European Union Institutions, Bodies, Offices and Agencies, Commission notice on technical guidance on the classification of waste (2018/C 124/01), 9th April 2018. Extractive Waste Directive (EWD) 2006/21/EC of the European Parliament and of the Council of 15 March 2006 on the management of waste from extractive industries and amending Directive 2004/35/EC. Mason, B., 1966, Principles of Geochemistry. 3rd Edition. John Wiley & Sons, Inc. New York and London. Waste Framework Directive (WFD) 2008/98/EC of the European Parliament and of the Council of 19 November 2008 on waste and repealing certain Directives.